Tools used to diagnose hardware problems and check components for standards compliance. 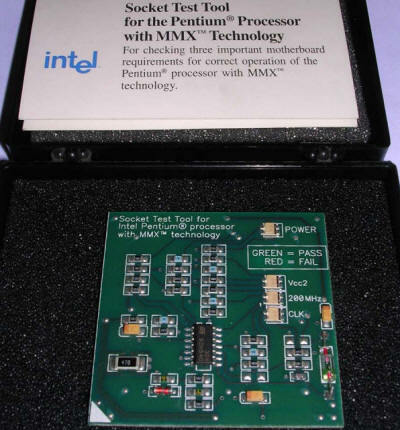 In second half of 1990s Pentium processors became more and more popular. 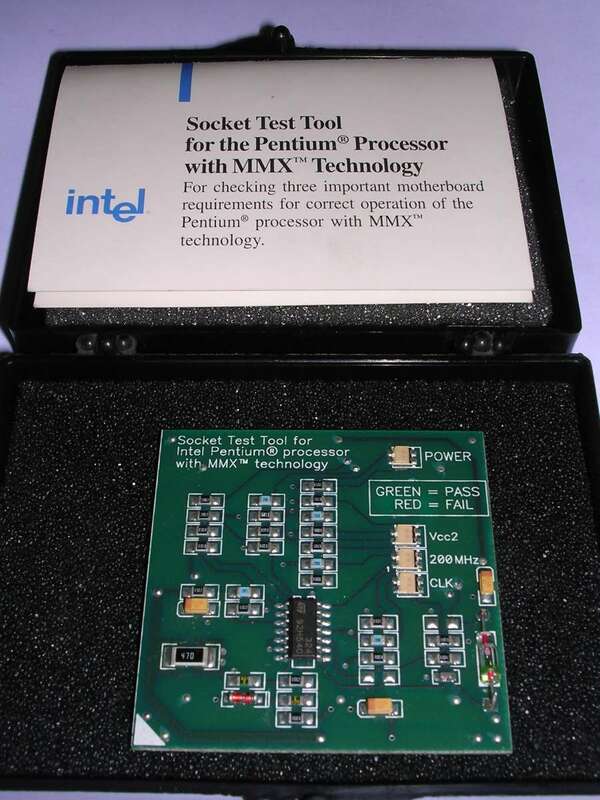 Contrary to 486 boards, Pentium ones were made using a variety of chipsets utilizing totally different technologies. It was not easy to predict what processors are supported by what mainboard and manufacturers information was scarce after releasing board. 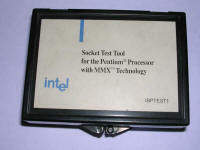 For computer manufacturers needs, Intel released some testing tools to test will the mainboard run the specific Pentium processor. 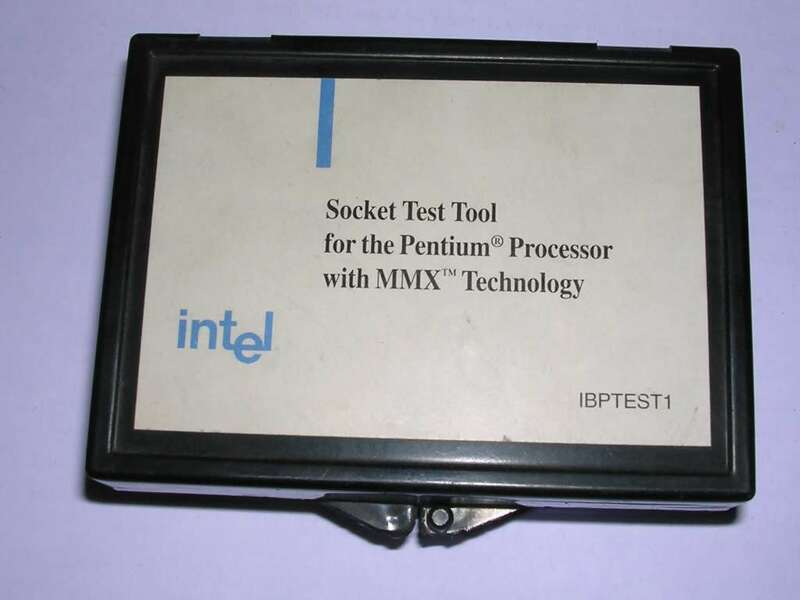 This one is for Pentium MMX - checks whether core voltage is proper, are the settings configured for 200MHz and is clock amplitude proper. 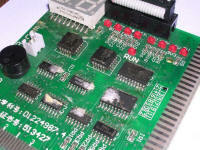 It is inserted in socket and mainboard is started. 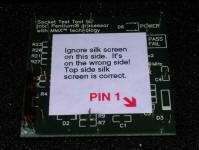 The result can be read with green or red LEDs. This tool is professionally made mostly with SMD technology, but one interesting thing can be spotted on its bottom. 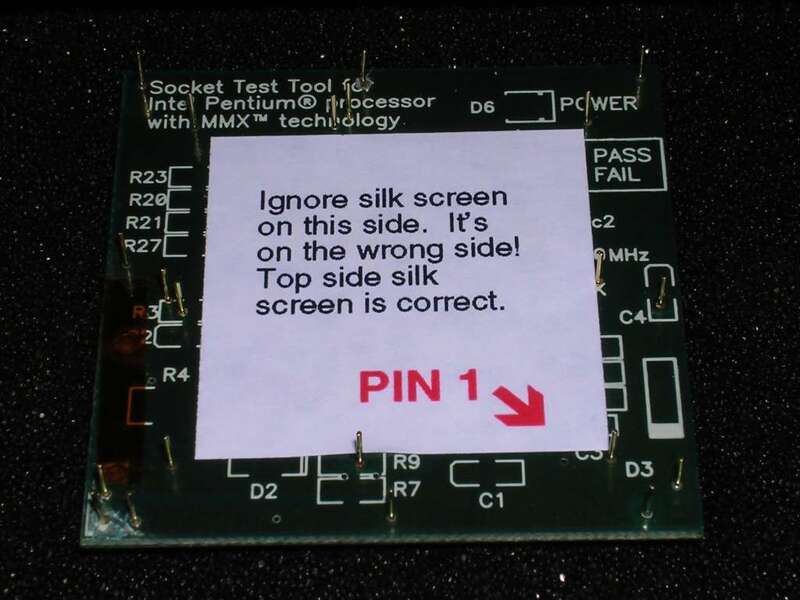 There is a silkscreen of similar tool and a sticker informing to ignore pin 1 on it. 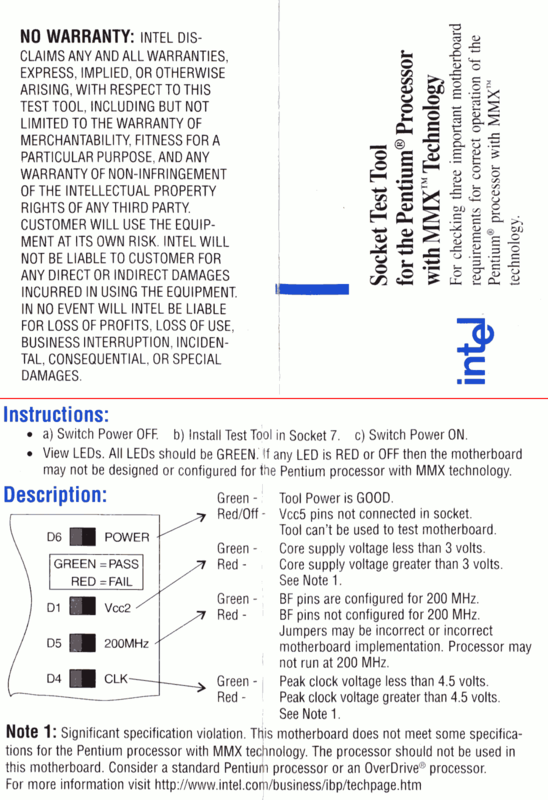 I think that the silkscreen is for another tool, also manufactured by Intel. 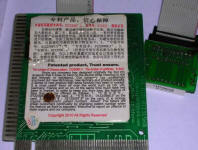 They made 2 PCBs on one substrate and it was only dependent on components and pin drill which tool was made. 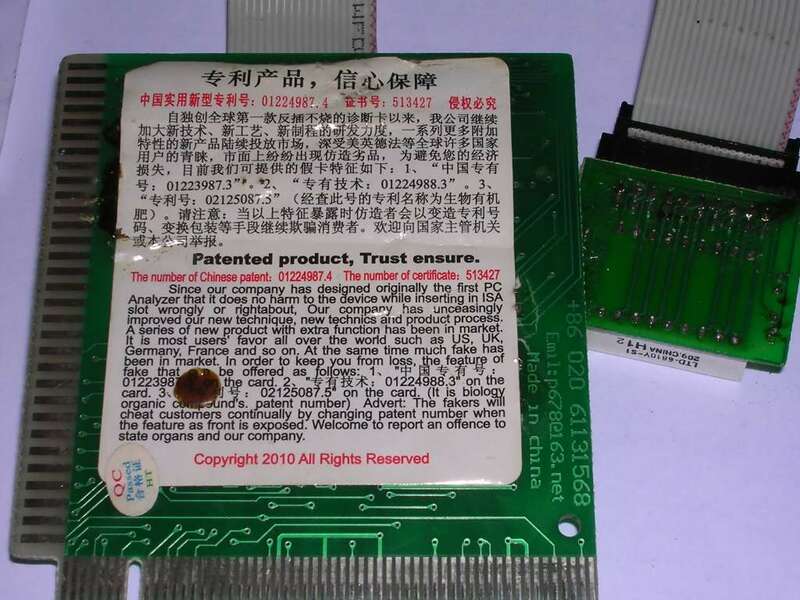 Information: I bought this board new, in hermetically-sealed bag, in 2007, and it had this sticker with "Copyright 2010" glued to the solder side with solder flux. These boards are made to show, on 7-segment display, a BIOS POST code. Before the failing system beeps for help, it puts codes for successive POST tests on a system bus. The board is made to capture and display these signals as well as states of some lines on bus. 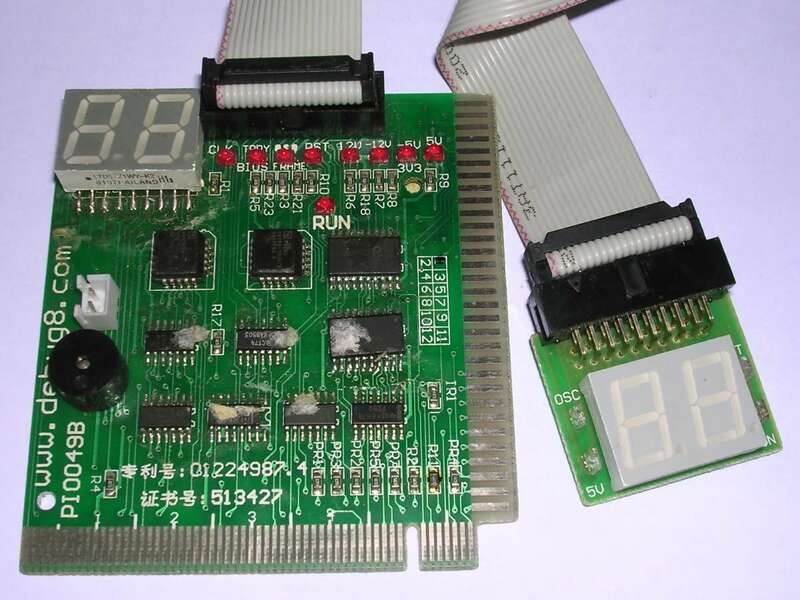 Another display can be connected on a ribbon cable to improve visibility. The problem with this board is quality. It is awful. Components are soldered not straight and it's a miracle that they don't short pads. After 2 months I had to correct solders on display and I foundnthat it doesn't stick to board at all. Generally, if you want to buy such board, look carefully for good quality. The address, debug8.com, was leading to manufacturer website until 2008-2009, so the thing about Copyright from 2010 is false. Manuals to a few similar boards and extensive POST codes list.